Pages - All about apps in YOUR classroom! Quick strategies on how to get you started using this wonderful word processing app. 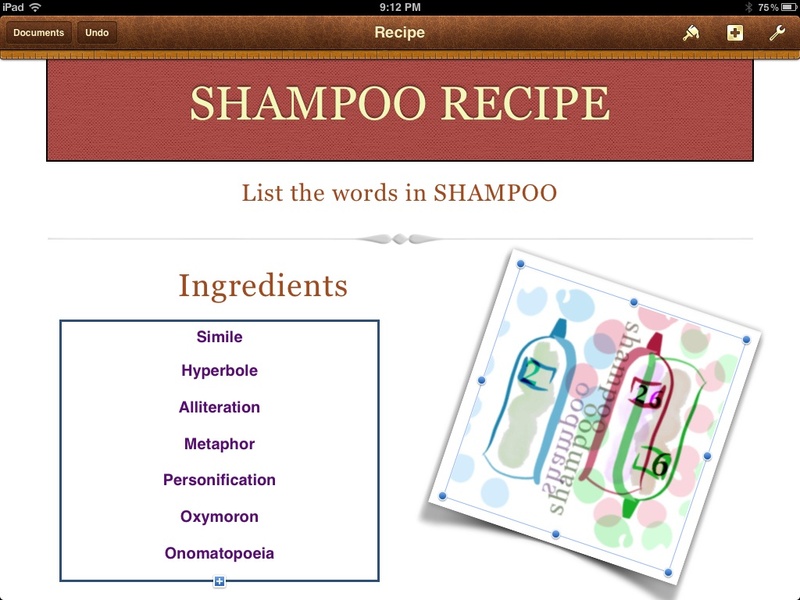 Pages is a word processing app that works well when writing essays, letters, recipes, posters, flyers and much more. There are plenty of templates to choose from including a blank page. You can create folders in Pages just like to create folders for your iPad apps. Inserting pictures (media), text, charts, shapes and tables is quick and easy. Adding video of your students speaking is another great feature. Below are simple lessons, screen shot examples and a vodcast of how to use pages. Assemble an expository essay and create a flow map using pages shapes by typing in the parts of the essay. Then students can formulate the essay using the flow-map. Develop the essay by writing directly in to the Pages App. Then press arrow at the top of the page and email it to the teacher. Pages saves automatically. Develop the essay further by inserting video and pictures from the iPad Camera App. Students can also create text boxes to create quite explanations next to each picture of short video. Use pages to write a persuasive essay defending whether the Constitution of the United States is either inductive or deductive reasoning. Support your argument using example from the text. Use pages as a journal to evaluate a standard that was mastered. The student kind write for 5 minutes using supporting details from the standard. Evaluate why density does not depend on size and shape after completing a graph of mass (g), volume (ml), and density (g/ml). Defend your argument by inserting pictures of the lab where mass and volume change. Then calculate the density and compare the three parts. After collecting data and placing the data on a graph in numbers or on paper, take a picture and insert the picture into pages. Examine the graph that your will compare, contrast or criticize from your experiment. Analyze the data in a summary or conclusion. Read a passage in history or language arts. Create a Compare and Contrast Thinking Map (Double Bubble) of the passage. Then use the Thinking Map and complete and quite write distinguishing your findings. Illustrate a free-body diagram on paper of a car moving down a road. Place the value and Newtons on the diagram. Take a picture of your diagram. Write a summary describing the free-body diagram. You may also use the camera to take a video of ELL students interpreting the diagram verbally. Insert the video into Pages and write the interpretation next to or underneath the video in a text box. Interpret a picture in a book; write and choose what you think is happening in the photo. 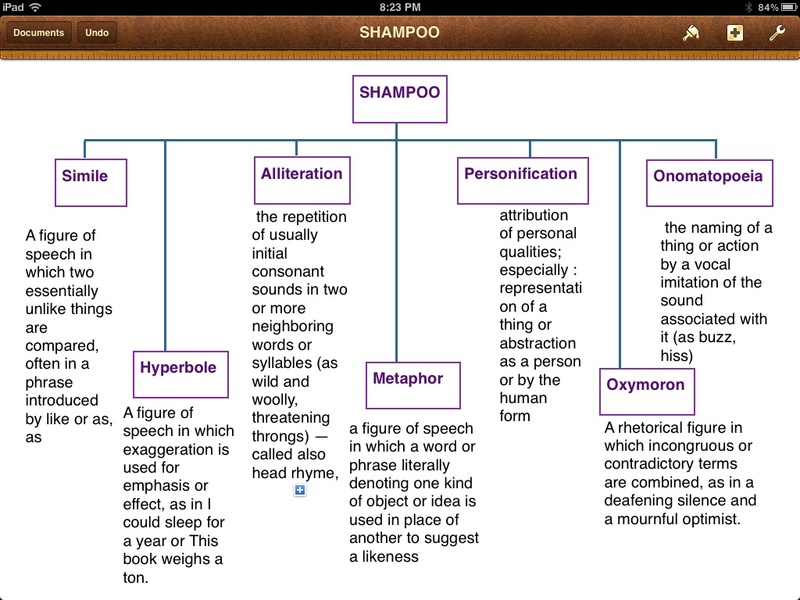 Use a text box to create a Classifying Thinking Map (Tree-Map) of SHAMPOO (Simile, hyperbole, alliteration, metaphor, personification, oxymoron, and onomatopoeia Describe each word underneath the word in a text box. Explain each word in a quite write below your Thinking Map. Create a describing map (bubble map) by inserting circles. Tap on the plus (+) and insert any circle, double tap and type a vocabulary word. Use describing words to explain the standards based vocabulary. Locate pictures, take a photo and insert the photo into the map. List and define the vocabulary related to a particular standard using pages. Read each word in the list. To recall the word create a picture on paper. Use the iPad camera and take a photo of the picture or drawing you created. Insert the picture into pages. Repeat this for each word and definition. Use Pages to practice the vocabulary. Questions on how to use Pages? Email Mina J. Blazy with any questions you have about how to use this app in your class, or if you would like more specific suggestions for how you can use this app in your content area. 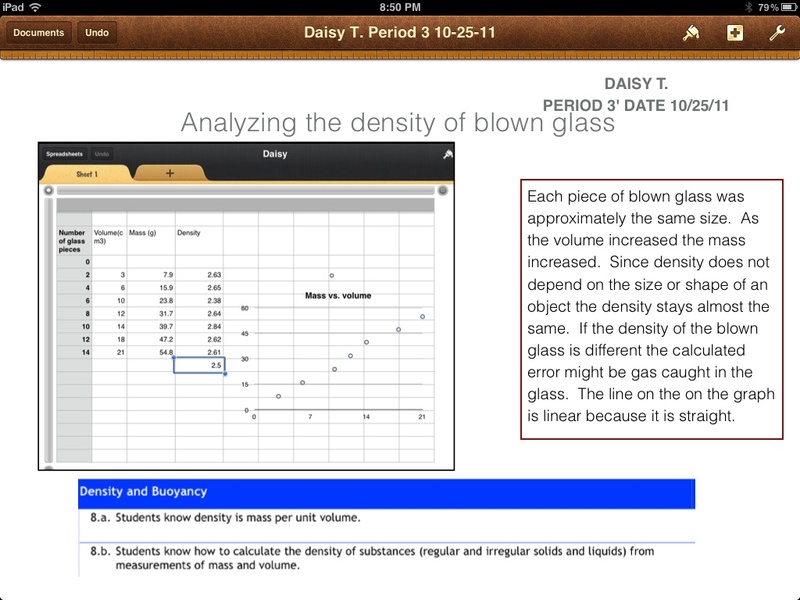 Here are some screen captures of student work and a Vodcast on how to use Pages. The above is a screen shot of student work. The student inserted a picture on the left and on the right the student inserted a text box. Use the plus (+) sign at the top of pages to insert pictures and text boxes. Students created a classify map inserting words in a text box. Use the plus (+) sign at the top of the Pages App. You can insert text boxes with or without borders. Double tap the box to start typing.